The information about fifth-generation jet fighter is partially disclosed. Hindustan Aeronautics plane maker has posted on its website some of the specifications of the FGFA model, thus raising the curtain over the future jet fighter created by Russian and Indian developers on the basis of Russia’s PAK FA. While some of the disclosed figures are quite predictable, some others are truly puzzling, if we believe everything that the Indian developer has to say. However, many of the basic parameters of the future jet fighter still remain undisclosed. The Fifth Generation Fighter Aircraft (FGFA) is an Indian fighter being developed by India’s Hindustan Aeronautics Limited (HAL) and Russia’s Sukhoi based on the T-50 aircraft (PAK FA). Russia and India signed a contract for the creation of the concept and technical design on 21 December 2010, the amount of transaction being $295 million. It was planned that front-end engineering would take 18 months. During this phase, Sukhoi will account for 80% of the total volume of work. 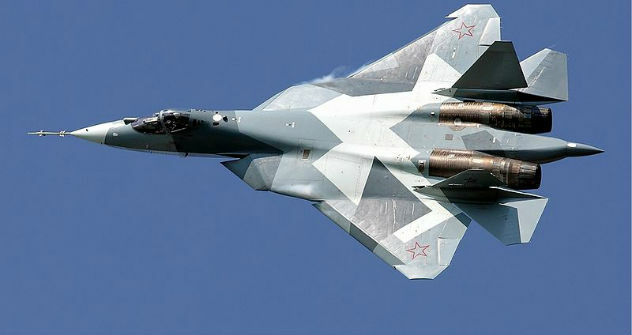 The Russian side has not yet disclosed the T-50 characteristics. According to the description available on the Hindustan Aeronautics website, the proposed FGFA will have air combat superiority and media exchange systems to communicate with similar aircraft in conditions of poor communication support. They do not specify what “poor communication” stands for. HAL must be referring to jamming. It is also noted that the FGFA has a network centric warfare capability by getting access to the Indian Defence Ministry’s database. (In mid-October 2010, India launched AFNET digital information grid, aiming at centralising the command of the country’s Air Force. AFNET will later be combined with information grids of the Defence Ministry, the Navy and the Army. As a result of this centralisation effort, the Indian Armed Forces will coordinate their activities via a single data management and exchange system). Other characteristics mentioned by the Indian developer include increased stealth, cruise at speeds well above Mach, and supersonic manoeuvring capability. The last feature is not specified, because “manoeuvring” can mean both aerobatic manoeuvres, which envisage a colossal impact of G forces on the pilot at supersonic speeds, and regular changes in the height and direction. The length of the Indian fighter is 22.6 meters, its height is 5.9 meters, and its maximum takeoff weight is 34 metric tons. With a maximum speed of 2 Mach (2,300 kilometres per hour), the jet fighter will have a range of 3,880 kilometres. The FGFA will feature two jet engines and have thrust vector control, with jet nozzle angle of +/-150. HAL does not mention in the description whether the FGFA will get all-aspect thrust vectoring, but it seems it will, because the Russian T-50 (PAK FA) will have all-aspect thrust-vector control. According to HAL, each engine will reach a thrust of 1,400 kgf (13.7 kN). This one is a puzzling characteristic, because this thrust will clearly be insufficient for a heavy fighter. To compare: Indian heavy fighter Su-30MKI is powered by two Al-31FP turbofans, each producing 7,670 kgf dry and 12,500 kgf in afterburner. The Indian specialists must have lost a zero somewhere – a thrust of 14,000 kgf looks suitable for the FGFA. In September 2011, Indian Air Force Chief Norman Anil Kumar Browne said the military had chosen the engine that would be installed in the FGFA. The power plant will be introduced in two phases, following the T-50 patters. The Al-41F1C will likely become the engine of the first stage, whereas the one selected by the Indian Air Force will be used for the second stage. There is no information about the latter yet, except for the fact that it will produce more power than that to be installed in the T-50. According to the description on the HAL website, the FGFA will have a maximum internal weapon load of 2.25 tons and external weapon load of 5.75 tons. The FGFA weapon load will therefore total 8 tons. The fighter is still at the design stage, so the reported figures are not final and will probably be adjusted after the prototype is created. The FGFA is expected to make its first flight in 2015 and go into service in India in 2017 or 2018. In early October 2011, Browne said the Indian Air Force would procure 214 FGFA planes in addition to the 272 Su-30MKI that it already has. Previously, Indian Defence Minister Arackaparambil Kurien Antony said some $25-30 billion would be spent on new fighters. Browne added that 166 single-seat FGFA models would be purchased, while the remaining 48 fighters would be two-seaters, although the original plan was to buy only two-seaters. Soon after India announced its plans to buy new jet fighters, some experts said single-seat FGFA would likely be different from the T-50 in the way that the Su-30MKI is different from the Su-30 of the Russian Air Force. In February 2011, HAL Finance Director D. Shivamurti said the FGFA development project would cost a total of $6 billion, and the Indian side would account for 35%-40% of the work. Specifically, Indian specialists will be developing an onboard computer, navigation system, data displays in the cockpit and the plane’s self-protection system. The two-seater will have more serious distinctions than just a larger cockpit. HAL Chairman of the Board Ashok Baweja said that the two-seater would have wings, fins, rudders and electronics different from those of the T-50. Also, the design of the Indian fighter must account for the use of Indian-made weapons, including Astra air-to-air missiles or Nirbhay cruise missiles.